You are here / South Africa Travel News / Events and Festivals / FOUR Annual Festivals You Don’t Want To Miss! Now reading: FOUR Annual Festivals You Don’t Want To Miss! Every city has one – a festival you just cannot miss. One that is worth going to because it’s spectacularly unusual, and for a moment you can almost pretend that your life is hip and happening (I’ll speak for myself, shall I?). Here are four such festivals – unusual, creative, slightly whacky (a couple of them) and worth attending for the promised exhiliration you will feel as a result. There will be those of you who argue about other equally as entertaining festivals, but I’ve selected those I think stand head and shoulders above the rest, mostly for originality. I missed it. Darn. To those of you who managed to get there, wow, this is one festival that looks simply unmissable. 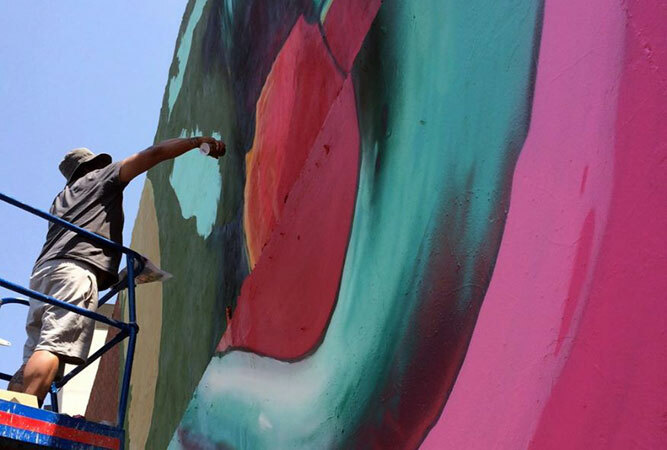 April 2013 was the third year for this Urban Art Festival. Graffiti and street artists from around the world hit the streets of Johannesburg in various events at different locations in the inner city. International artists are there to inspire the local graffiti / street art community by exposing them to new skills and stimulation. Many young South African artists can’t get overseas for exposure, and this is a great way for them to broaden their horizons. At the same time, the urban environment gets a facelift with some incredible street art. The events and mural projects are all open to the public, which goes a long way to revitalising this part of the city. The festival includes exhibitions, large-scale mural projects, film-screenings, street art tours and a party. As the audience you buy a ticket but don’t know who you will see performing until you arrive at the ‘voorkamer’ (front room or lounge) of somebody’s home in the town of Darling, just up the West Coast from Cape Town. You buy a ticket for a route (there are seven routes in total) and during your ‘journey’ you visit three different homes in Darling. There are twenty one performance in total, so obviouly you’re encouraged to take more than one route. The homes range from township RDP homes to large Cape Dutch dwellings. And you’re transported back and forth by the local taxi companies. You can watch anything from dance to musicals, drama, comedy, storytelling and magic. And there is usually a Perron Social dance and disco evening at Evita se Perron (also the starting point). Good news is that you can still make it to this year’s festival. Booking opens on 1 July. 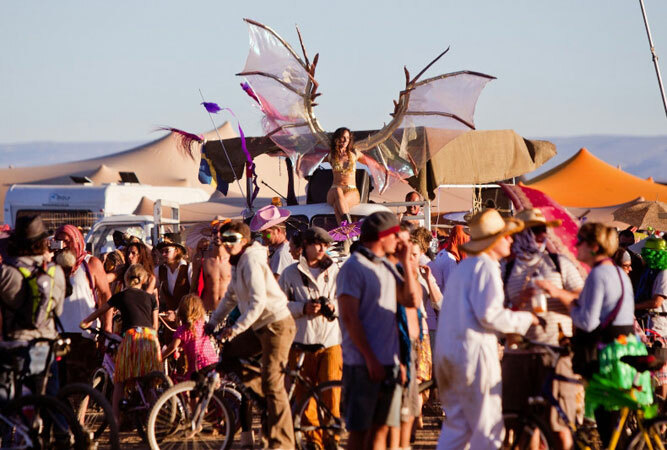 AfrikaBurn is a community of participants who come together to create art, burning structures, costume, performance, theme camps, music, mutant vehicles and more. The emphasis is on ‘creative expression’ and the event, which happens in the middle of the Tankwa Karoo, is run by volunteers – the participants make it happen. The community is guided by a set of 10 principles some of which are: creative cooperation and collaboration; participation – without active participation the event won’t happen; immediate experience; gifting (there are no commercial sponsorships or advertising); leaving no trace – respect for the environment; radical inclusion – anyone may take part; self-reliance, and radical self-expression. This incredible event has also just happened for 2013; mark your calendar – 346 days to go! so that you don’t miss the next one. Holi One Colour Festival is billed as the world’s biggest colour festival. It launched just this year in South Africa. The original Holi Festival takes place in India – a festival of music and dancing with a unique twist: everyone gets to throw special coloured powder into the air, and at one another, to express freedom and the colour of everyday life. As you can imagine, the concept has become extremely popular and similar colour festivals have sprung up in Berlin, Dresden, Munich, Hannover, the US and Singapore. The festival includes electronic music, performance and visual art and everyone wears white (obviously). Coloured powder is thrown into the air on the hour, every hour after 2pm. Holi One Colour Festival doesn’t just happen in Durban. It also takes place in Cape Town and Jo’burg. I was lucky enough to get to the Holi One Colour festival in Cape Town. It was crazy! Next time I’ll be sure to take along goggles and a small zip-lock bag for my phone. I’m yet to experience AfrikaBurn! I have always wanted to go to the Colour Festival, It looks like alot of fun, I cant wait for the next one in Cape Town! I’ve always wanted to go to the Voorkamerfest but miss out getting tickets because I don’t plan. Hopefully this year I’ll remember to book early.